How do I keep my caramel from melting before I make my truffles? I'm trying to make caramel maple truffles but I'm having trouble. I froze the caramel but when I tried to roll the caramel it melted before I could dip it in chocolate!! Should I put something in the caramel???? My first question is, what kind of caramel are you using? 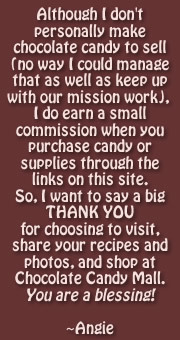 Are you following some particular recipe, or are you using bought caramel? You can buy really great caramel for candy making at Candyland Crafts. They have a softer and a firmer choice available. If you are making your own caramel and it is melting at room temperature, perhaps you didn't heat the caramel to a high enough temperature when cooking. Usually caramel needs to be cooked to the "firm ball stage" (see candy syrup stages). If you believe you've done that and you are still having problems, check your thermometer to see if it is accurate. Here's a good salted caramel recipe if you (or another visitor) needs one. You may be able to salvage your current caramel concoction by slowly reheating it and bringing it up to a higher temperature. If necessary, add a little cream to loosen it up, but not too much or it will take you that much longer to get it back up to the desired temperature. Looking forward to hearing how it all turns out! Yes, do try reheating the caramel and bring it to a higher temperature this time. It shouldn't take that long to set if you have reached the correct temperature. Also, you can test your thermometer by boiling water and seeing what the thermometer reads. It should be 212 degrees at boiling point. If it is not, adjust your candy making temperature up or down as needed to coincide with the difference. Hi Angie Thanks for the tips; This is a recipe on line that I found It called for me to boil pure maple syrup and 1/2 & 1/2 1 cup to a boil to 239* Fahrenheit. I left it for two days in the refrigerator. then put it in the freezer I then tried to roll it out and it melted it could from the room temperature. I will take your advice and try to boil it again and see what happens.